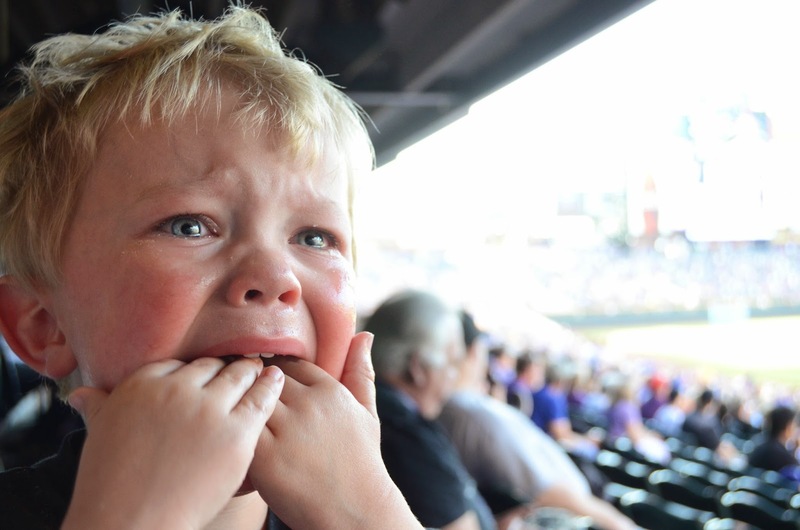 Loving What We Live: We Tried; He Cried; Go Rockies! 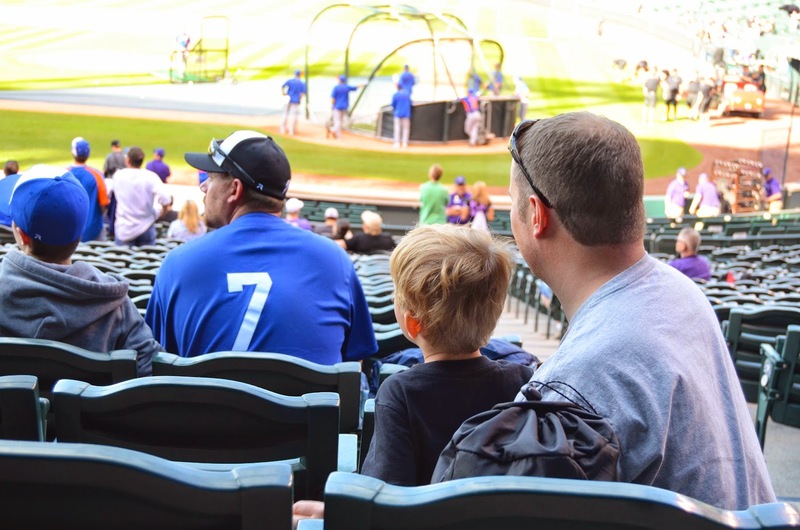 Sometimes you have winning moments as a parent, and other moments make you realize how difficult being a parent can be. This was one of those tough times. 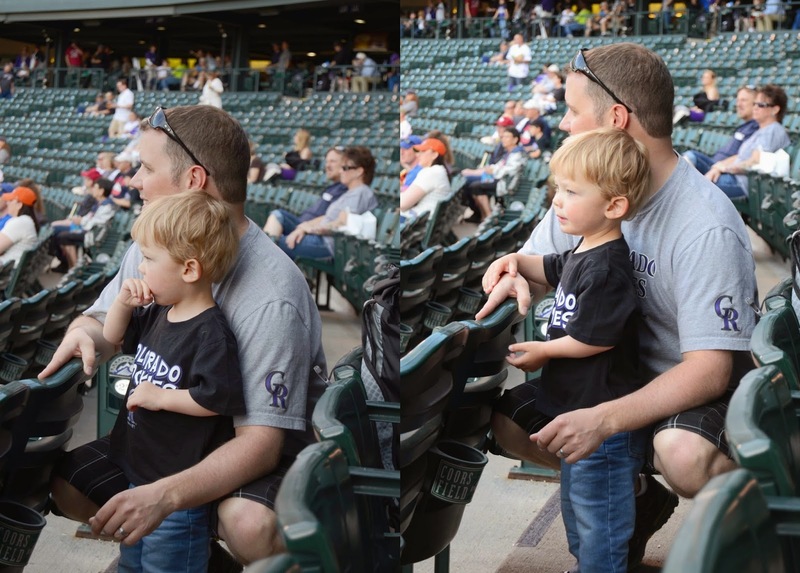 We spent the day talking about going to the baseball game, we practiced our "Go Rockies!" cheer, we were excited to spend a lovely, warm evening enjoying America's pastime. But, sometimes things don't always go as planned. There is a lot we are still learning about our little man as he grows, and although we had a really rough experience at the high school basketball game this winter, we hoped that his love of baseball would prevail on this spring day and we would have a better experience. We paid the $20 to park. We paid $29 for two hotdogs, one beer and one Sprite. We got to our seats, and for two seconds we thought it might be a win. Then the music got louder, the announcer got louder, and my boy got scared. One thing we have learned is when he gets excited (good or bad), he will often seek to help process those emotions by chewing. His hands immediately flew to his mouth. He didn't know if he should cheer, or cry. We each took a turn walking him down to the playground at the end of the concourse. He would perk up, enjoy himself, and then immediately cry as soon as he returned to our seats. Talking about catching, throwing and hitting did nothing to calm to him. I looked at his face (and the photo almost pains me to post as stirs so many emotions), and knew it was time to go. So before we were even in the bottom of the first inning, we picked up our bags and walked out of the stadium as huge lines waited to come through the turnstile. As soon as we exited the stadium to the street, he was fine. Forty-nine dollars, and an hour after we arrived, we were back in the car with a boy who as always was just eager to yank his shoes and socks off. We got home took a walk around the block to settle us all, and then funny enough turned on the ballgame on the TV, where my little man loudly, proudly shouted "CATCH IT!" Like I said, things don't always go as planned.